A post in one of the threads there got me singing this, it seems the only solution for a lot of people sadly- the problem has become the solution. All through' the day I me mine. All through' your life I me mine. Once upon a time, in students days, it was Sgt Peppers. It was the very first CD I bought, not even having a CD player at the time.. but the anticipation of hearing the layering and kaleidoscope of effects in digital clarity was something that appealed to my naive self. I progressed from there to the White Album being the solid favourite.. for the sheer extent and range of styles. When I caught myself on and got a vinyl player Rubber Soul moved into the number one spot.. probably because the production value of the vinyl seemed to beat all the other albums on vinyl. Rubber Soul also has what I consider their best song "In My Life" which has been my favourite forever and a day. Now I have a playlist of my favourite songs on in the car. Tracks like Bulldog, Baby You're a Rich Man, Only a Northern Song and some of the lesser played out ones. Of course, I get much more value these days from The Kinks... whose lyrics I find much more appealing. Their whimsy and nostalgia for a lost and dying England get me, which I fine strange given that I'm an Irish Republican. More of a Stones fan tbh. 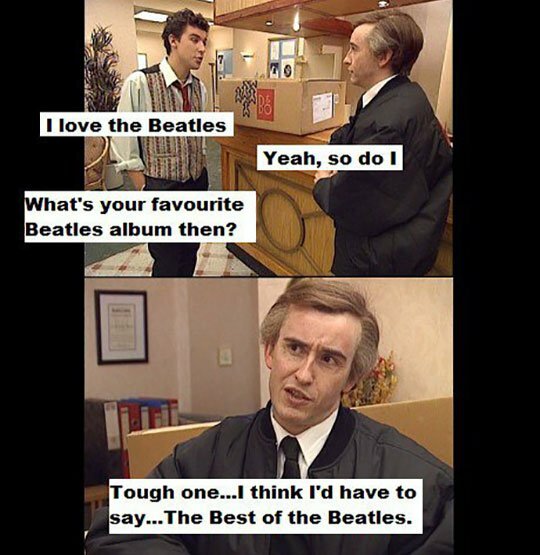 That is why the thread is called whats your favorite Beatles album lol. The thread reminded me of that clip from Alan Partridge. Such a quotable show. At one stage with the Stones, during the seventies, half the band were drug addicts with serious problems. Surprised they could walk to the recording studio never mind play anything decent.